Interesting study on paleo-rivers of the Sahara providing insight for a likely route for Homo sapiens to cross the Sahara towards NW Africa. Figure 2. Simulated probability of surface water during the last interglacial. number of sources (including , , , . typical ‘Mousterian’ points, side scrapers and Levallois technology. geomorphological setting to belong within MIS 5e , . As discussed in other occasions, it seems likely that some genetic remnants of those early migrations are still visible in at least some NW Africans. North African autosomal genetics through the prism of ADMIXTURE. Major upheaval of human Y-DNA phylogeny: we are all ‘A’ now (on some very ancient lineages shared by West and North Africans). Recently David Sánchez (of Noticias de Prehistoria – Prehistoria al Día[es]) asked me to collaborate in a series at his blog on the early prehistory and expansion of Homo sapiens, from the viewpoints of both archaeology and population genetics. I gladly accepted, of course. The first articles will be published in the next days/weeks at his blog (I plan to make synthesis of them in English here but not full translations – too much work). The bulk of the archaeological materials will be done by David, while I am taking responsibility mostly for the genetic aspects. As he has been preparing the first article on the African Middle Stone Age, David stumbled upon a quite fascinating curiosity that was unknown to both and is probably of interest for the readers of this blog: the existence of well-finished proto-harpoons in the MSA of Katanda (North Kivu, D.R. Congo, near Uganda – not to be confused with another larger town named Katanda in the Kasaï-Oriental province) dated to some 110-80,000 years ago. I can only imagine that this quite unknown but fascinating materials should be of interest to the readers of this blog. Three archaeological sites at Katanda on the Upper Semliki River in the Western Rift Valley of Zaire have provided evidence for a well-developed bone industry in a Middle Stone Age context. Artifacts include both barbed and unbarbed points as well as a daggerlike object. Dating by both direct and indirect means indicate an age of approximately 90,000 years or older. Together with abundant fish (primarily catfish) remains, the bone technology indicates that a complex subsistence specialization had developed in Africa by this time. The level of behavioral competence required is consistent with that of upper Paleolithic Homo sapiens sapiens. These data support an African origin of behaviorally as well as biologically modern humans. This discovery has been mentioned later on by more accessible materials, for example: D’Errico & Stringer 2011, D’Errico 2006 (in French) or a book by Luis Raposo (in Spanish). Regardless of the speculations about the so-called “modern human behavior”, what it clearly means is that those ancient Africans produced well-finished barbed proto-harpoons (not known of otherwise until Magdalenian times in Europe) and used them to fish in the Semliki river (being one of the earliest documented cases of this kind of economy). 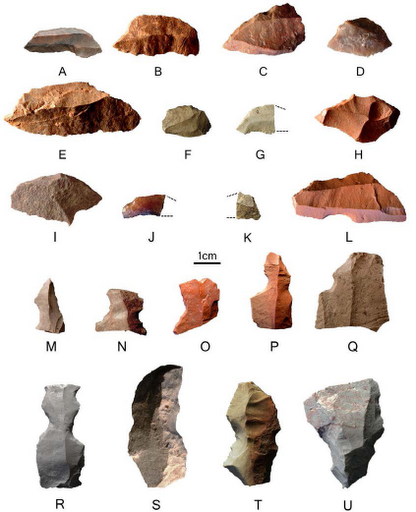 A new paper argues for the importance of ill-researched early African stone technologies in human techno-cultural evolution, based mostly on the heat-treated microlithic technology used at Pinnacle Point and its persistence through time. There is consensus that the modern human lineage appeared in Africa before 100,000 years ago1, 2. But there is debate as to when cultural and cognitive characteristics typical of modern humans first appeared, and the role that these had in the expansion of modern humans out of Africa3. Scientists rely on symbolically specific proxies, such as artistic expression, to document the origins of complex cognition. Advanced technologies with elaborate chains of production are also proxies, as these often demand high-fidelity transmission and thus language. Some argue that advanced technologies in Africa appear and disappear and thus do not indicate complex cognition exclusive to early modern humans in Africa3, 4. The origins of composite tools and advanced projectile weapons figure prominently in modern human evolution research, and the latter have been argued to have been in the exclusive possession of modern humans5, 6. Here we describe a previously unrecognized advanced stone tool technology from Pinnacle Point Site 5–6 on the south coast of South Africa, originating approximately 71,000 years ago. This technology is dominated by the production of small bladelets (microliths) primarily from heat-treated stone. There is agreement that microlithic technology was used to create composite tool components as part of advanced projectile weapons7, 8. Microliths were common worldwide by the mid-Holocene epoch, but have a patchy pattern of first appearance that is rarely earlier than 40,000 years ago9, 10, and were thought to appear briefly between 65,000 and 60,000 years ago in South Africa and then disappear. Our research extends this record to ~71,000 years, shows that microlithic technology originated early in South Africa, evolved over a vast time span (~11,000 years), and was typically coupled to complex heat treatment that persisted for nearly 100,000 years. Advanced technologies in Africa were early and enduring; a small sample of excavated sites in Africa is the best explanation for any perceived ‘flickering’ pattern. Supplementary materials (PDF) are freely available. Supplementary Figure 2. 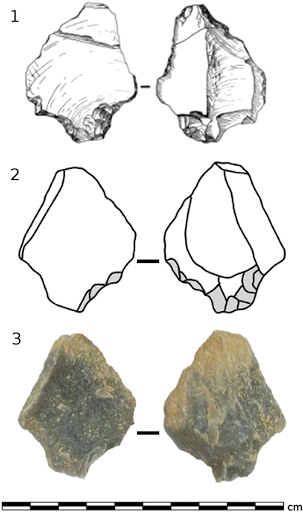 Artifacts including crescent shaped backed blades (A-L) and notched blades (M-U) from the DBCS at PP5-6 show affinities with the Howiesons Poort industry. Backed blades are oriented with backed edge up and unmodified edge down. Notched blades are oriented parallel with axis of flake removal.